Muktinath, a village and temple with the same name, is located at an altitude of 3,800 meters in the Mustang district of Nepal. Muktinath lies at the foothills of the Thorong La Mountain which is also a fraction of the Himalayas. The shrine of Muktinath above Thak Khola is one of the major pilgrimages for the Hindus and Buddhists of the religion. For the Hindus, the place is a “Mukti Chhetra” meaning the "place of salvation". For the Buddhists, Muktinath is the Chumig Gyatsa which in Tibetan means 'Hundred Waters', a very important place of Dakinis, goddesses known as Sky Dancers and one of the 24 Tantric places. Muktinath temple is also one of the eight most sacred shrines for Hindu Vaishnavas of the order Svayam Vyakta Ksetras. Hindus also worship the shrine of Muktinath as the manifestation of the God Vishnu. The idol is of human size and is made from gold. Another important part of the shrine is the Prakaram, the 108 bull faces pouring very cold water. Interestingly, an old Buddhist monk and Buddhist nuns present in the temple conduct the worshipping of the idol. 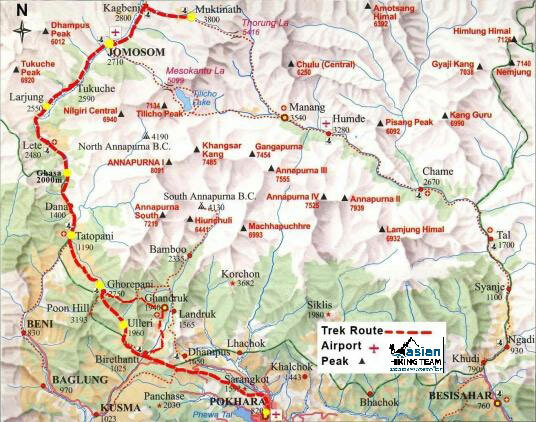 Cycling in Muktinath you can take 3,4 days from Jomson Muktiath to end in Benin. Our itinerary brings you fly from Pokhara to Jomsom, cycling to Muktinath valley. Explore the pilgrim side and biking to Tatopani (hot spring). Continues rides to Benin and Pokhara. Duration of Trip: 6 nights 7 days. Type of Trip: bike cycling. Accommodation of Trip: Hotel /Lodge. Meals in Trip: B/L/D as hotel restaurant menu. Staff and equipment of Trip: Biking Guide / all necessary equipments / each moderate bike. Highlight of Trip: Pokhara city - the tourist paradise of Nepal / Muktinath the hindus and Buddhist Temple / Jomsom, Kagbani Marpha the tropical Thakali village, food and there customs / Tatopani –Natural hot spring can relax for your tried muscle. Short itinerary of trip: Pokhara – Jomsom – Muktinath – Tukuche – Tatopani – Beni - Pokhara. Day 01: Kathmandu to Pokhara 800m 6 hours drive by tourist bus. Day 02: Fly to Jomson 25 minutes start biking trip to Kagbani (3115m) 1.30 hours. Day 03: Biking to Muktinath 2 hours, explore around Muktinath Temple area and villages 2 hours ride. Day 04: Muktinath to Tukuche 2590 m 5 hours ride. Day 05: Tukuche to Tatopani 1189m, 5 hours ride. Day 06: Tatopani to Beni Bazaar 830m 4 hours ride. Day 07: Beni Bazaar to Pokhara 5/6 hours by bus. Equipment for Guide and Porter. Early morning drive to Pokhara by tourist bus and visit around the Lake site dinner overnight in Hotel. Day 02: Fly to Jomsom 25 minutes start biking trip to Kagbani (3115m) 1.30 hours. Our flight is early morning to Jomsom after your arrival our staff will be waiting in Jomsom airport because our all the cycles and equipments been there by Jeep. Prepare few hours and have a some food then we start to ride over the Thak Khola valley. Way to kagbani the cycling route is moving stone so it so funny and some more adventure. Stay overnight in Kagbani, visit the monastery. Today is all the way to climb to Muktinath but w follow the seasonal road. Crossing the Jharkot village, explore around the monastery and herbal medicine central then continues to Muktinath. After lunch we explore the temple area and the muktinath village by mountain bike. Stay overnight in lodge. After lunch we start same way to Akle Bhatti and Jomsom, we have lunch in jomsom then one hour to Tukuche passing marpha village, its beautiful village and explore around overnight lodge. We following the Thak Khola valley, the route is over the stone-sand of Kali Gandaki. It is so beautiful deep valley till to Tatopani. It takes around 5 hours then we bring you in natural hot spring 5 minutes from Hotel Overnight in Hotel. Day 06: Tatopani to Beni Bazaar 830m 3/4 hours rides. Follow the Kaligandaki valley the seasonal road to Beni 3/4 hours and explore the Beni Bazaar stay overnight in hotel. Day 07: Beni Bazaar to Pokhara 5 hours ride. After our breakfast we start follow all the way motor able road till to Pokhara passing the Kusuma Bazaar, Naya Pul, Naudanda, Hangja and Pokhara, Stay overnight in Pokhara. Note: This itinerary is subject to be change as your schedule. It is possible to do Ghorepani Pun hill trekking combined with Muktinath tour. What is the weather in Nepal for tour? Best time for tour in Nepal is autumn (September, October-November) and spring (March, April and May) but whole year is possible short tour around Nepal. You need to be prepared for sudden weather changes while touring. That's why tour equipment should be chosen carefully before the trip as season. "Asian Hiking Team" pays big attention to weather forecast. What kind of Accommodation during the tour? Nepal has a huge range of accommodation facilities that range from international standard star hotels to budget hotels and lodges. Most hotels offer a choice, bed and breakfast and one other meal or room and full board. It would be a good idea to tell us well in advance as your budget and book hotels as per need. Such small hostelries are favored by budget tourists and FITs also possible for tour. Kathmandu offers a wide range of accommodation from high all the way to hostel style dorm rooms. High range; Swimming pool, 24 hour generators, 24 hour hot water, cable television, valet, room service, wi-fi, restaurant. Mid range: back-up generator, 24 hour hot water, cable television, wi-fi, restaurant, tour desk, airport pick up. Budget range: back-up battery/generator, solar power water, cable television, shared wifi, restaurant, tour desk, airport pickup. Basic range: solar power water heater, cable television, shared bathroom, wifi, tour desk, airport pickup. Chitwan offers a wide range of accommodation from high resort to budget hotel or lodge. High resort have all the facilities as 4/5 star hotel such as Swimming pool, 24 hour generators, 24 hour hot water, cable television, valet, room service, wi-fi, restaurant etc. budge range resort /hotel have back-up battery/generator, solar power water, cable television, shared wifi, restaurant, ac room etc. Lumbini and Pokhara offers accommodation from high range all the way to home style. High range; Swimming pool, 24 hour generators, 24 hour hot water, cable television, valet, room service, wi-fi, restaurant. Mid range: back-up generator, 24 hour hot water, cable television, wi-fi, restaurant, tour desk, airport pick up. Budget range: back-up battery/generator, solar power water, cable television, shared wifi, restaurant, tour desk, airport pickup. Home stay: solar power water heater, cable television, shared bathroom, wifi, eating and sleeping with host family. Tour in others part of Nepal such as Bandipur, Nagarkot, Dhudikhel, Gorkha, Daman, Muktinath, Palpa, Ilam, Janakpur, Kodawari, are budget to 3/4 star facilities. Where do we eat our meals during tour? During a tour you will have breakfast in the same hotel, lunch and dinner will be eaten at one of the tour side restaurants except Chitwan safari tour all meals eaten in same resort or hotel. All Hotels/restaurant of our tour routes have variety of different food items, such as rice, vegetables, noodles, potatoes and soup, and have western food on menu. Every Hotel serves the traditional Nepali meal Dal Bhat Tarkari (rice, curry and lentil soup). All of them have soft and branded hard drinks, snacks; wine and beer are available. Food safety is always a big concern and we take it very seriously. That is why we have chosen the cleanest and most hygienically kept Hotel for our routes. What sort of experience does Tour Guide have? Leader / Tour Guides have many years of touring experience all over cultural and historical places in Nepal, Bhutan and Tibet. Most of them have been spending years exploring the country. Our tour guides have certificate from Nepal Academy of Tourism and Hotel Management (NATHM). All our guides speak fluent English and happy to share their deep knowledge of the culture, geography, botanical, festivals, life style of Nepalese with you. We have also different language specking guides as clients’ require. We believe in and follow the idea that it's not enough to take visitors to special places or special cultures, we need to provide guides who can get people feel involved in what they are experiencing, explain it thoroughly and keep them entertained. They know very well how to facilitate running smooth and safe trip appreciating the beauty of her people and her culture. "Asian Hiking Team" company is prepared for any emergency situation and knows how to handle it. Our tour guides are trained in first aid and can deal with most of the basic ailments that occur during a trek and directly connection in main office Kathmandu each day. Every client should have his own insurance before coming to Nepal for case of emergency. Our all tour guide has insurance in case of emergency. Major part of the touring area has hospital facilities so if in case of emergency doctor on call. Our services are intended to offer quality and value for money, together with a rich, varied and a rewarding experience. We have built our reputation as the best travel agent in the country for the best service provider. Our prices of all the tours are highly competitive and unmatched with any other local tour operators. We operate tour with two different kinds; Full organizes service - you want to be free from all concerns to enjoy this experience to the fullest. Guide and accommodation only - you prefer to eat lunch and dinner yourself but want to benefit from the tour guide's experience & knowledge, accommodation and transportation.